In late June thousands gathered across the U.S. to protest the Trump administration’s border policy. Rallies in Portland turned violent and had to be shut down by police. US Congresswoman Maxine Waters (D-CA) recently urged her supporters to harass members of the Trump administration in public places. At weekend rallies she called for the impeachment of President Trump. Immigration is perhaps the most contentious issue that defines an increasingly divided electorate. While there are reasonable differences on immigration policy across the political spectrum, the reactivity of the left on this subject makes substantive and reasoned dialogue impossible. The reaction of Trump opponents to the President’s immigration policy, especially the the supposed cruel separation of children and families at the border, may actually be partially rooted in a repressed personal and national trauma. Millions of our fellow citizens have participate in the death of their unborn children. Countless others have served as accessories to abortion – e.g., driving a friend to the procedure, paying for it, or persuading a pregnant woman that abortion is the only reasonable decision. Large segments of the population have lost an unborn son or daughter, grandchild or other family member to abortion. The Shockwaves of Abortion impact people across the political spectrum. But when we look at the liberal left, particularly those who are most reactive on the issue of immigration and border concerns, this is a group of people that are zealously pro-abortion. We know that women who are traumatized by the invasive procedure, especially those with previous abuse, can for a time lose a sense of healthy personal boundaries and respect for their own bodies. This traumatic separation of parent and child can lead to self-destructive and abusive behaviors and relationships. Another way that caring women and men can deny and displace their disenfranchised pain and grief from abortion is by involvement in various forms of political activism and charity work. 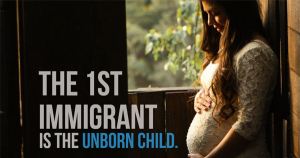 There is often an unconscious need to atone for the death of the unborn child that helps to fuel their human rights and charitable activities such as advocating for victims of human trafficking, immigrants and justice for the poor. Others focus passionately on issues such as animal rights and the environment. Some promote abortion rights to continually validate their own personal abortion decision. Just as some women can struggle with personal boundaries and self-destructive behaviors after abortion and other abuse, so too can a political movement that is zealously pro-abortion. Liberal politicians and activists advocate an open borders policy that fails to protect the interests of citizens and taxpayers. Such movements tend to reject their own national heritage and culture. Nations and their citizens can share a collective unconscious need to atone for the death of their unborn children. In the U.S., intense outrage is focused on the supposed cruel separation of parents and children at the border. Yet we ignore the violent separation of mothers and their unborn children as their babies cross the border of the womb to the outside world dismembered and broken by the procedure. Some European nations are no longer preserving and valuing what is best in their culture and heritage as collapsing birthrates and uncontrolled immigration threaten the very existence of some countries. The symptoms suffered after abortion are rooted in the inability to express and process the feelings and memories from the abortion event, and come to a place of healing and peace. The heart of recovery involves going through a safe process to express those painful feelings and memories, repentance of one’s role in the abortion, and most importantly, reconnecting in love with the aborted child or children. Hopefully, as we continue to share the truth about the impact of abortion and resources for healing, we can step back from national divorce, and come together once again as a nation. This entry was posted on Monday, July 2nd, 2018 at 8:18 pm	and is filed under Uncategorized. You can follow any responses to this entry through the RSS 2.0 feed. You can leave a response, or trackback from your own site.